There are no special holiday hours at rec centers this holiday season? December’s second-Saturday concert for tots will feature not one, not two, but 11 bands and musicians playing from 10 a.m. to 4 p.m. to celebrate the recently released Farmers’ Market CD. Look for The SHE’s, Erin Brazill & the Brazillionaires, Lily Holbrook, Mick Shaffer, Kailua Blue, Brian Bergeron, Circus Finelli, The Improbabillies (formerly Failure to Disperse), David Kesler, Kif and James Byfield (of Blind Lemon Pledge)—all featured on the CD. There will be face painting for the kids and food trucks on the basketball court. 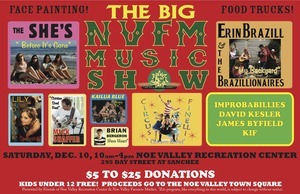 A holiday event co-sponsored by the Friends of Noe Valley Recreation Center and the Noe Valley Farmers’ Market, the concert celebrates the music played at the market each Saturday. Richard Hildreth, who arranges music for the market and for the second-Saturday tot concerts at Upper Noe, produced the CD. His goal was to do more than showcase great local musicians, he said. He also hopes to raise awareness of the neighborhood’s effort to buy the parking lot that hosts the market, on 24th Street between Sanchez and Vicksburg streets. “One thing I’ve already noticed is how many people are still unaware of what could happen to the parking lot,” Hildreth said. The lot is owned by the Noe Valley Ministry, which needs the money from a sale to refurbish its 123-year-old Sanchez Street building. Advocates are hoping the city will use some of its open space acquisition funds to cover at least part of the estimated $4 million asking price. Neighborhood-raised funds would cover the rest of the acquisition costs, the conversion of the lot to a flexible-use town square and upkeep. Visit Residents for Noe Valley Town Square to stay abreast of the progress. Scroll down to the post on Feb. 22, 2011, to see the conceptual drawings of the square. Donations at the party will go toward the Town Square effort. 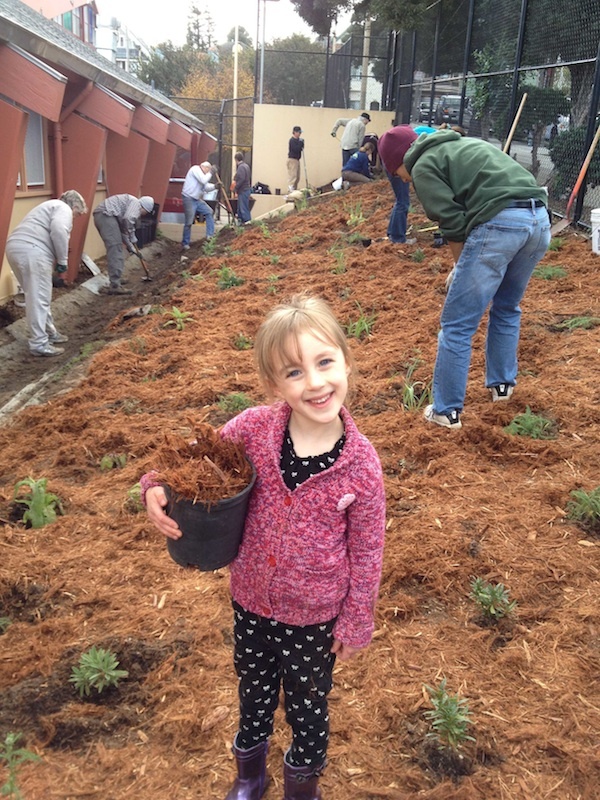 Thanks to all who came out and helped plant the long-neglected backside of the Recreation Center! Young and old, familiar faces and new—-many people helped make the Sanchez Street side a more beautiful place. The effort started Saturday, Nov. 12, when volunteers prepared the site for planting. The following Friday and Saturday, volunteers planted hundreds of plants. Nature did its job, too, adding heavy rain on Sunday that probably helped start the plants on the right foot. The dream to green the Sanchez Street side of the center is an old one. Lead Ladybug Gardener Joan Lionberger, who has lived across the street from Upper Noe since she was born, said she doesn’t think this hillside has ever been planted, so it was quite a monumental occasion to get it planted with hundreds of native California plants. There are a few more plants that we can use to fill in a few more spots in early December. A special thanks to Teresa O’Brien, park section supervisor, Kristin Bowman and Brian Dwyer from the Recreation and Parks Department, who helped make the planting happen. Upper Noe’s Community Recreation Council will hold its second meeting Wednesday, Dec. 14, from 7 to 8:15 p.m., when staff expect to introduce the center’s new facility coordinator and continue discussion from the first meeting in November. Last month, six residents joined Recreation and Park staff at Upper Noe’s first CRC meeting to discuss programming and storage. “We’re thinking of more dance and theater for adults and tweens,” said Thomas Iglesias, the site’s temporary facility coordinator. Three council members have preschool-aged children, so there was also discussion of the immensely popular tot programming and the availability of the auditorium for open tot hours. “All the neighborhood members thought the tot programs were a big success and a vital part of the neighborhood,” said Kate Haug, a neighbor and FONVRC co-chair who is serving on the council. The community members agreed that the heavy use by children, their families and their care-givers added a vibrancy to the park. “It’s a great example of a public space providing a needed service to the community,” she said. At the same time, everyone agreed that expanding programming and use of the auditorium are goals for the Council, she said. One challenge will be to juggle class times to make best use of the space for all ages. Storage looms large because the auditorium’s many toys—a joy to the tots who play there but a barrier to multi-purpose use—cannot be stored beneath the stage because the access is too difficult, he said. Iglesias continues to invite anyone interested in influencing the center to come to the meetings, though in the future they may be closed to all but council members. Councils comprised of staff and local residents based out of each recreation center in the city will eventually shape local programming, an idea the department rolled out about a year ago. Ideally, the Councils have seven members, including one teen. To fill out an application, please ask at the Rec Center, or show up at the meeting, or print out the version on our website, www.noevalleyreccenter.com, under the tab “Getting Involved.” To learn more, please email Iglesias at thomas.iglesias (at) sfgov.org or his supervisor, Karla Rosales at karla.rosales (at) sfgov.org. Registration for winter classes begins Saturday, Dec. 17, and Upper Noe and its surrounding sister centers have dozens of classes for all ages on tap. New this term at Upper Noe is a tango dance class for seniors, said Facility Coordinator Thomas Iglesias. “It will be our first senior program in a while,” he said. There will also be the usual run of art and movement classes for tots. Tweens and teens can join basketball teams for three age levels, plus the usual tennis and Muy Thai kickboxing classes. Adults can whip themselves into shape with a boot camp or a Pilates class. One neighborhood over, the Eureka Recreation Center, 100 Collingwood Street, has a long list of classes that include more options for tweens, adolescents and adults, like cooking, dodgeball and street hockey. There is also a social club for seniors. Across Mission Street, St. Mary’s Recreation Center, Murray Street and Justin Drive, offers dance and martial arts for all ages, plus adult tennis. Bernal Heights Recreation Center, 500 Moultrie Street, has a line-up of classes very similar to Upper Noe’s. To the south, Glen Park Recreation Center, Elk and Chenery streets, offers seniors art and fitness. Adults can relax with Tai Chi, and children can enjoy a month of Saturdays with Tree Frog Treks, a science education and adventure camp. To register, visit www.sfreconline.org. The department has re-vamped its website, so the browsing process has changed. To see our programs or those at our sister centers, select Browse Programs and do an advanced search for All Programs. You can then browse by facility. All our local recreation centers have the same business hours: Tuesday to Friday, 9 a.m. to 9 p.m. and Saturday 9 a.m. to 5 p.m.
Bernal Heights, Glen Park and Upper Noe recreation centers will all offer mid-December holiday workshops for the under-five crowd. At Upper Noe, young ones will celebrate the holidays with crafts, songs and stories at Holiday Happenings, a two-day workshop on Dec. 14 and 16 from 10 to 11:30 a.m. Bernal will also have a holiday camp the week before Christmas. See www.sfreconline.org for more details. To search by facility, choose Browse Programs, then do an advanced search for All Classes. You can then sort by facility. The San Francisco Recreation and Parks Department invites San Franciscans to the 82nd annual lighting of the venerable Monterey cypress tree at McLaren Lodge in Golden Gate Park, Thursday, Dec. 8, from 5 to 7:30 p.m. The evening is free and features small rides for children, live entertainment, a cookie factory, arts and crafts and a visit from Santa. For more information, visit www.sfrecpark.org. • Serve as a greeter for the free concerts. The Friends of Noe Valley Rec Center need a “friend” to help us greet families during our monthly free concert. Let them know about our mailing list and introduce them to our small group. Our greeters hand out flyers and accept donations for the concert series. The next opportunity will be Dec. 10 from 10 a.m. to 4 p.m. Even volunteering for one hour would make a big difference! • Help advise the city on what classes should be offered at the Upper Noe Rec Center. Serve a term on the Upper Noe Recreation Center’s Community Recreation Council and help shape programming at the Center. A teen member is still needed! Please contact Thomas Iglesias at 970-8061. The form is available on our website and at the center. Please either drop it off or mail it to: Thomas Igelsias, UNRC, 295 Day Street, SF, 94131. Celebrate the release of the Farmers’ Market CD by dancing to the kid-friendly bands who appear on the disk. Santa, reindeer, cocoa, shopping specials: you can find a full line-up on the calendars available in 24th Street shopping district stores. Walk or ride the motorized cable car along 24th Street from Chattanooga to Diamond streets at the first Noe Valley Holiday Wine Walk. Participating wineries include Terra Sávia Bourassa Vineyards and Wine Thieves. Buy a “Tasting Wristband” prior to the event at http://www.sresproductions.com/noe_valley_holiday_wine_walk.html or on-site at the Farmers Market parking lot between Sanchez and Vicksburg. Wine glasses and a map of tasting locations will be available at the parking lot. The San Francisco Recreation and Parks Department invites San Franciscans to the 82nd annual lighting of the venerable Monterey cypress tree at McLaren Lodge in Golden Gate Park. The evening is free and features small rides for children, live entertainment, a cookie factory, arts and crafts and a visit from Santa. For more information, visit www.sfrecpark.org.